On his Facebook post, Desmond Dalanon shared that they went to the said office at 5:30 in the morning. By then, the line was already very long and they were given a priority number of 74. Dalanon’s wife, Johanna said that the lady next to her, who do not have priority number was accommodated first. Dalanon complained how they waited until 2:00 in the afternoon to have their photos taken. The exhausted client said it took them 12 hours to secure their driver licenses. Dalanon further claimed that there were a total of 8 steps with 1-2 hours waiting time for each step. To make matters worse, a client had a heart attack allegedly due to stress and hunger and eventually died. Dalanon compared his experience in Pila, Laguna with another “makupad” LTO office in Tayuman, Manila. Like Dalanon, Fumera also hoped that the LTO offices would improve their services and queuing systems. 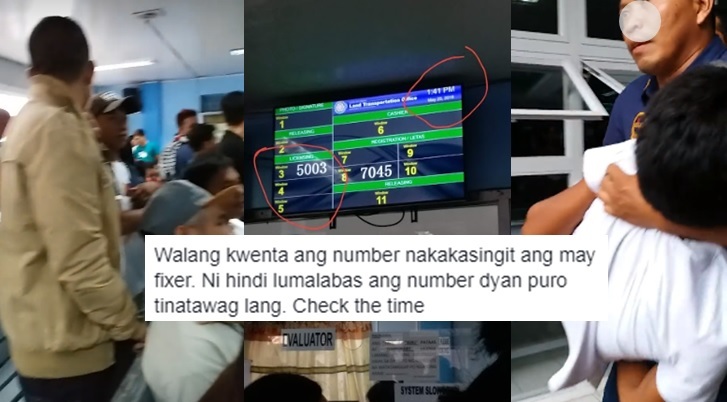 The mentioned LTO offices have yet to release their statements. LTO has just launched last April their online appointment system. The online system aims to provide faster processing of renewal of driver’s license and registration of vehicles. It's still on its pilot program and available only on five LTO district offices in Muntinlupa, Pasig, Novaliches, Marikina and in LTO Central Office in Quezon City. New or first-time applications are still not available. Rector Antiga, chief of the LTO's IT Division, said that aside from improving their queuing system, it also helps stop fixers.